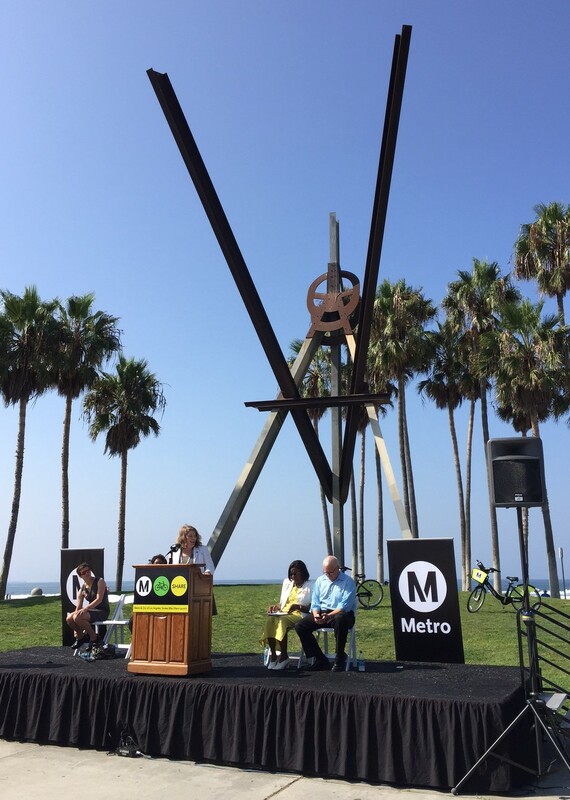 Today Metro Bike Share celebrated its expansion to L.A.'s Venice Beach neighborhood. All photos by Joe Linton/Streetsblog L.A. This morning Metro kicked off its third 2017 expansion of Metro Bike Share. 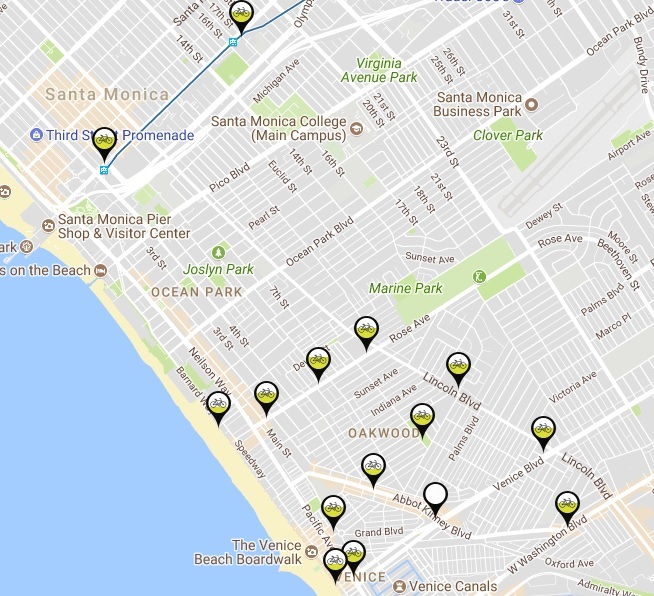 Today’s expansion adds 165 bicycles at 15 stations serving the city of Los Angeles neighborhood of Venice, including several in the adjacent city of Santa Monica, which connect the bike-share system to the Metro Expo Line. The bike-share opening was marked with festivities at Venice Beach’s Windward Plaza. 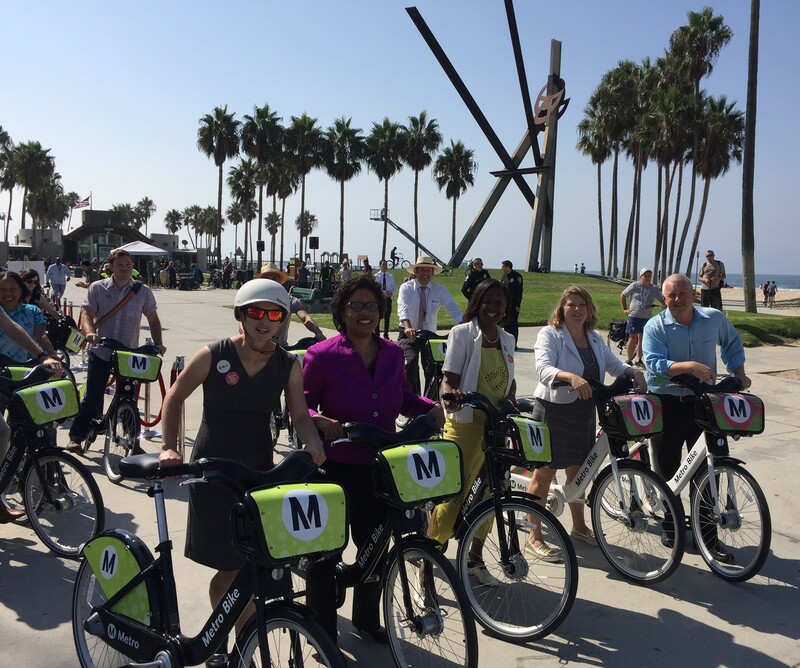 On hand to welcome the expansion were Metro Boardmember Jacqueline Dupont-Walker, Boardmember and L.A. City Councilmember Mike Bonin, Metro Deputy CEO Stephanie Wiggins, LADOT General Manager Seleta Reynolds, and Bicycle Transit Systems CEO Allison Cohen. Dupont-Walker mentioned a long list of communities where bike-share expansion is being evaluated: North Hollywood, Culver City, Palms, Burbank, Huntington Park, Marina Del Rey, East L.A. and the San Gabriel Valley, to which Bonin added Playa Vista. With recent state funding announced, the next expansions will likely be in the Downtown/USC/South L.A./Expo Line area, and the San Gabriel Valley. 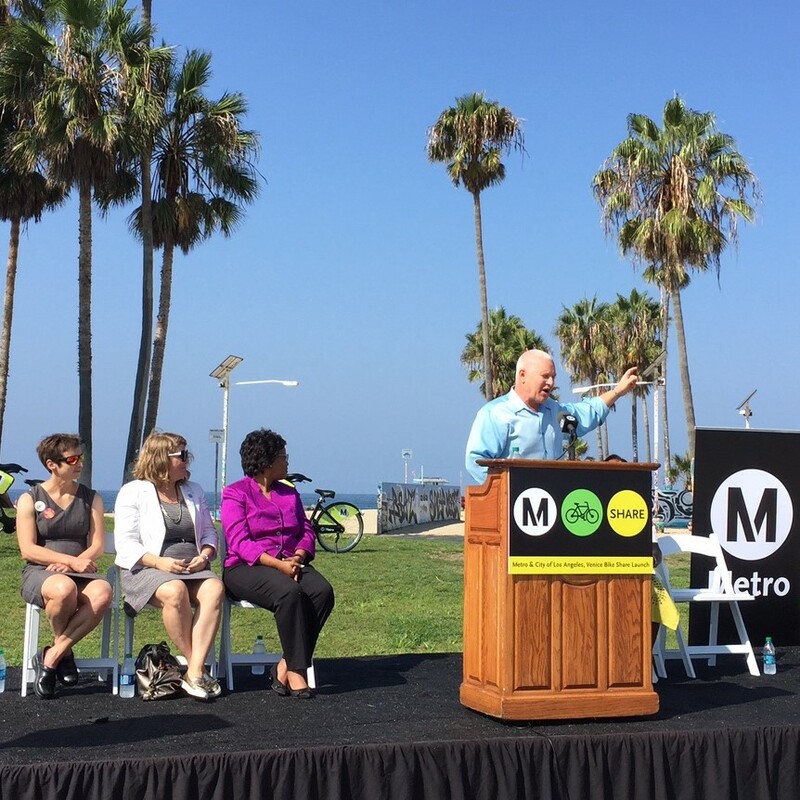 Councilmember Bonin, who represents the Venice community, emphasized the importance of creating inexpensive ways for Angelenos to get to the beach. 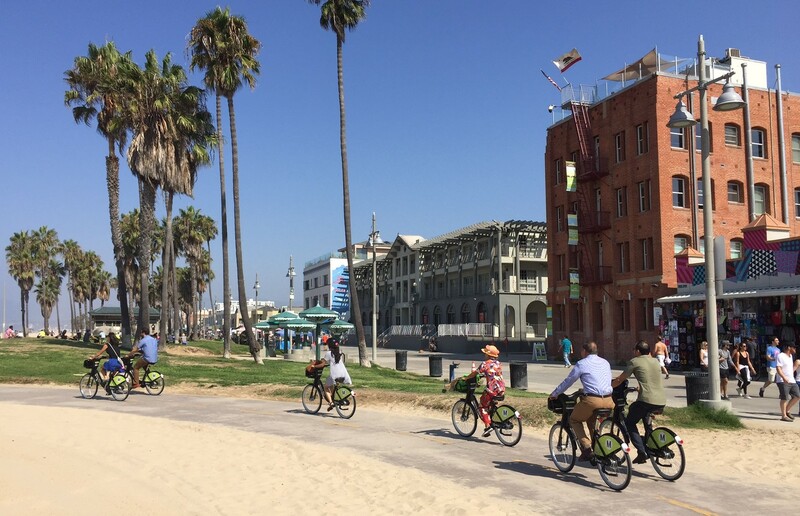 He praised the fact that Venice now has access to two bike-share systems, with Santa Monica Breeze and Metro Bike Share overlapping in the area. 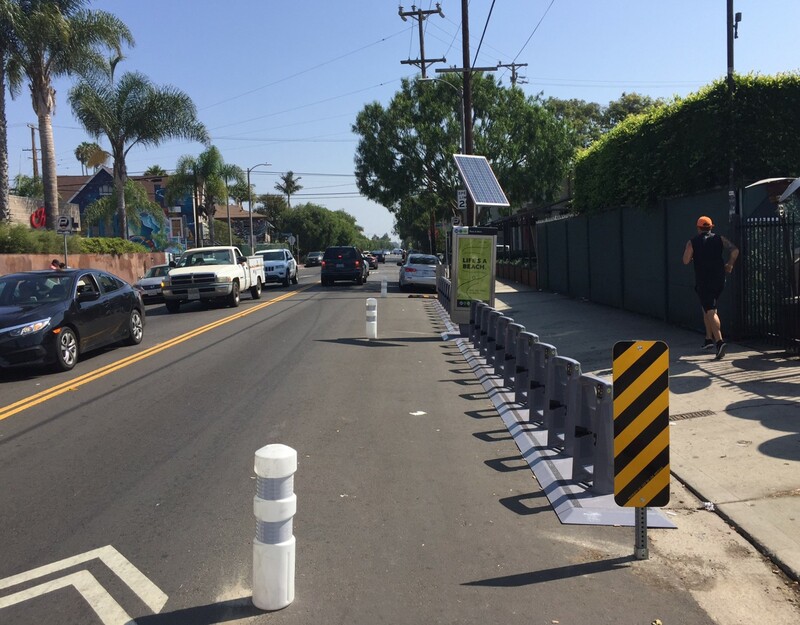 Reynolds also welcomed the redundancy, stating that Los Angeles is big enough for multiple types of bike-share. After the opening speeches, more than a hundred folks in attendance celebrated with a ride along the beach bike path. Two systems covering an area where there are also plenty of private entrepreneurs providing bicycle rentals. Bravo? Meanwhile there are so incredibly many places that could use Metro-sponsored bikeshare now. But please, don’t let me stop the patting-yourselves-on-your-backs. When is Lincoln Blvd. going to be a “People Way’ ? Simply put, the slickest way to funnel municipal funds into a company not even native to California. Taking up real estate reserved for pedestrians, cyclists, the handicapped, and littering the streets with bikes that get less than 1 ride per day. Who will ride these bikes if tourists cannot use international cards and will be charged a 50$ deposit? the target demographic makes no sense that is why Pasadena removed these bikes.